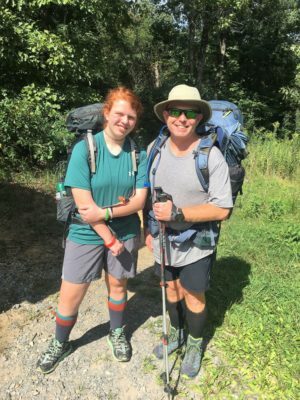 My daughter and I at the start of our backpacking trip to the Walls of Jericho in north Alabama. Over 100 miles of hiking and hours of wearing the Aspire socks at work have shown me these socks are the real deal. The socks are comfortable with a nice level of compression. The socks have also proven to be durable even after high mileage from long summer running to backpacking in California and Alabama. Click HERE for my final thoughts on these Swiftwick Aspire Socks. This entry was posted in Reviews and tagged backpacking, Big Basin Redwoods State Park, compression socks, gearreview, hiking, hiking socks, running, running socks, Swiftwick Aspire Compression Socks, swiftwick aspire twelve socks, Swiftwick compression socks, swiftwick socks, Walls of Jericho. Bookmark the permalink.